Perched on the clifftops of the Blue Mountains is an incredible home with a sandstone kitchen and kangaroo skin bed chiselled from stone. 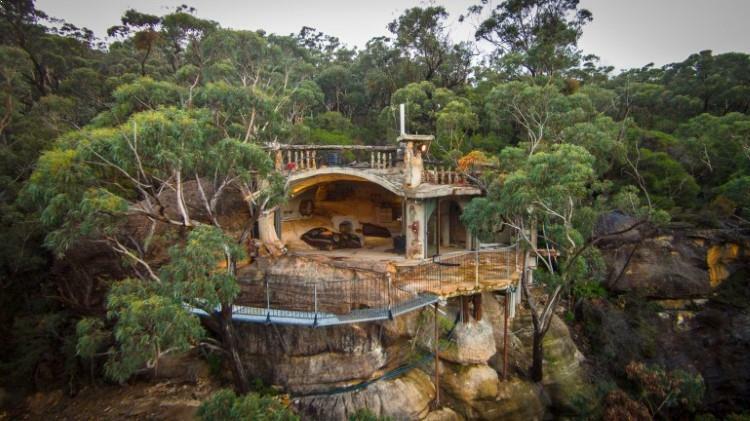 This cave home (see below) is the brainchild of Lionel Bucket, who inherited the 240 hectares of bushland it sits on. Mr Bucket used the location to build eco-friendly cabins for visitors; the first of which he built himself at the age of 17. The cave home also has a number of carvings inside that tell the history of settlement in Australia. This cave home will soon be available for guest hire, however at the moment Mr Bucket is living in it.